Usually, a mix of ingredients is needed in order to provide results for any type of ailment you may suffer from. In case of joint health, there are several ingredients identified over the years as being helpful for combating strain on the joints, improving the naturally occurring fluid between them and repairing the cartilage. Products that focused on just one ingredient are rare, and one of them is Hyalogic Joint Logic Lozenge. Based solely on hyaluronic acid – one of the best ingredients to have included in any joint health formula – this product promises to improve your flexibility and make you feel better even when aging. Hyalogic Joint Logic Lozenge seems to be a simple solution for one problem (the degradation of the naturally occurring hyaluronic acid in the joints), but a closer look is needed to see if this product is a good choice or not. 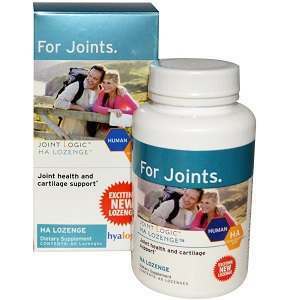 What Does Hyalogic Joint Logic Lozenge Contain? As you can see, you will not find an elaborated formula in this product. Hyaluronic acid is a very good ingredient to have, as it is the one responsible for maintaining your joints flexible even as you age or subject yourself to strenuous activity. While this product may be helpful in regaining part of the lost hyaluronic acid in your joints, it may not be as effective as others. The recommended dosage is one lozenge daily, dissolved in water, so you can easily swallow it. The product comes with berry flavor, to make it easier to take. There are 60 lozenges in one container, and one bottle is priced at 39.99USD. Seeing that the lozenges in one bottle can last up to two months, we can say that the product is reasonably priced. We saw no guarantee offered on the manufacturer’s website, but you can order a sample to see if the product is good for you or not. For a joint health supplement to work, certain ingredients are needed, such as glucosamine, chondroitin and hyaluronic acid. From an entire list of remedies with known effects on joint health, Hyalogic Joint Logic Lozenge contains just one, which does not place it among the most powerful products on the market. Nonetheless, because of its targeted action – to replenish the amount of hyaluronic acid in your joints – it can be an ally in your fight against joint aging. Mark Stevens	reviewed Hyalogic	on October 8th	 and gave it a rating of 2.